Practice Areas – Stephen Guillette & Associates P.C. Guillette Law will help you in recover substantial compensation for your car accident injuries, lost wages, pain, suffering, disability and other damages. Car accident injuries can include whiplash, broken bones and concussions They may cause more serious injuries involving traumatic brain injury, paralysis, dismemberment, amputation, herniated disc and spine injuries, or even death. Guillette Law represents surviving families of those who have suffered death due to another’s negligence, incompetence or recklessness. Guillette Law helps surviving family members pursue wrongful death claims, obtain compensation for funeral expenses, loss of future earnings, medical bills, and conscious pain and suffering from the parties responsible for the wrongful death. Under certain circumstances, punitive damages may be awarded as a consequence of a wrongful death. Construction site accidents are common industrial accidents because of the nature of the work duties, the use of heavy equipment and hazardous job sites. Massachusetts’ law permits different types of compensation for construction-site accidents. If the injured person is a worker on the site, the Massachusetts’ workers compensation law permits recovery against one’s own employer. This usually involves payment of medical expenses, lost wage replacement and some specific compensation for permanent injuries and scarring. The employer enjoys immunity from lawsuits from its employees, if the employer participates in the workers’ compensation program. Depending on the circumstances of the accident, sometimes there is the potential recovery from other persons and business entities on the job site, such as subcontractors, general contractors, architects or property owners. This recovery is in addition to workers’ compensation benefits, and of sometimes permits the injured worker the chance to be fully compensated for his or her injury. The injured party in this situation seeks to hold these parties other than their employer liable for their failure to keep a construction site safe, or their liability for the injuries sustained by the employee. Given that most parties on a job site are required to be well insured against accident claims arising from a construction site injury, there is a better chance of the injured worker being adequately compensated for his or her injury. Serious and catastrophic injuries, such as a severe head injury or an injury resulting in a major loss of function or amputation of an arm or leg, are not like whiplash or broken bones. Serious injury cases require more care when structuring a settlement or arriving at a judgment that will adequately care for your needs for the rest of your life. Boston’s Guillette Law can help. Stairway accidents can sometimes be the most devastating of injuries. Oftentimes, stairway accident injuries can take the form of severely broken legs, ankles and wrists. The cause of these types of accidents can be inadequate lighting, poorly maintained stairways, stairways in disrepair, or improperly built stairways. A missing hand rail, or hand rails that are not in compliance with the Massachusetts Sanitary Code, or the Massachusetts Building Code can help prove a claim against the stairway owner. We represent victims whether the stairway is inside or outside, a structure. Guillette Law has experience dealing with pedestrian collisions and bicycle accidents. If you have been injured due to the negligence of a car or truck driver, Guillette Law has a team of dedicated and experienced attorneys who will fight for the highest possible compensation for you. We are dedicated to representing those who have suffered a loss or disability in a bicycle accident or pedestrian collision. If you or a loved one has been involved in a motorcycle accident where the other driver was clearly at fault, and the insurance company involved is offering you a less than fair settlement, contact the Guillette Law for a FREE consultation today. Get help now. Guillette Law is dedicated to recovering fair compensation for victims of brain injuries, spinal cord injuries, medical malpractice, product liability, and other forms of personal injuries. 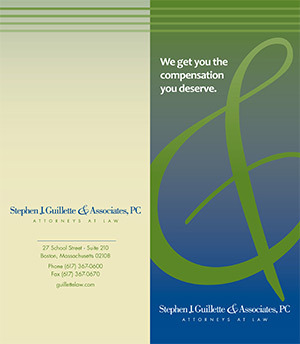 Guillette Law focuses on spinal cord injuries that result from automobile accidents or falls. Car accidents cause the majority of spinal cord injuries, followed by sports mishaps, falls, birth trauma, violence and disease. While some victims will experience almost complete recovery, others will be completely and permanently paralyzed. Guillette Law represents dog bite attack victims who have suffered serious injuries, rabies, puncture wounds and scarring, emotional trauma and wrongful death as a result of the attack. Often, dog bites cause permanent and disfiguring scars. Massachusetts law grant compensation for such permanent injuries. Contact Guillette Law today if you or a loved one is seeking legal help following a dog bite attack.